Create, price and order your own unique custom gradient online! Design a gradient for a kitchen backsplash, an exterior building wall, interior restaurant wall, a shower or tub surround. With height options from 2' to 200', unlimited width and a choice of over one hundred glass tile colors, the possibilities are endless. 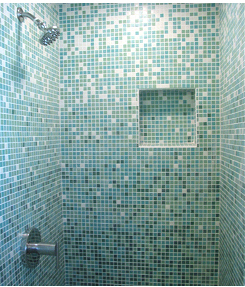 Experiment with the gradient height, the tile color order and how the various grout colors affect the look of the design. Install the design horizontally or vertically. Each sheet is clear film-face mounted and labeled in the upper left-hand corner for easy installation; an installation guideline is also included. Click below to start designing your gradient! Or jumpstart your imagination by clicking on any of the sample gradients shown at the bottom of the page.